Thames Discovery Programme - Tideway Events Programme! Tideway has joined forces with the Thames Discovery Programme to launch a FREE programme of events exploring the history and archaeology surrounding the River Thames. Between April and September 2017, we’ll be running sessions for eight to 18-year-olds (the Tadpoles!) to gain first-hand experience of foreshore recording and observation. Alongside these events, there will also be a series of guided family walks on weekends, skills workshops and free community lectures for adults, covering fascinating subjects such as ships and shipbreaking, and crime and punishment on the Thames. The Thames Discovery Programme’s volunteers have made discoveries that have changed our understanding of London and people’s interaction with the river over thousands of years. It has also helped Londoners to develop new skills and actively take part in the unforgettable experience of discovering the past. 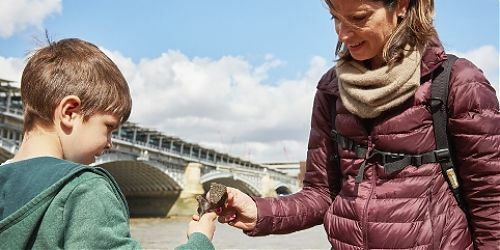 With this additional support from Tideway, the Thames Discovery Programme is creating a new, younger generation of archaeology enthusiasts through the development of the Tadpoles group, which will join the existing FROGs (Foreshore Recording and Observation Groups). It will also deliver curriculum-linked sessions on Thames heritage to London schools, both in the classroom and in the foreshore. The full calendar of events can be found on our events page.